The first game I chose to revisit for our Years Later series isn’t really that old at first glance. BioShock was released in 2007, only eight years ago. But when you consider that there have been two sequels to the game and that Irrational Games, the studio behind the game, isn’t even around anymore, the game does appear to show its age. After all, BioShock Infinite, released two years ago (a week ago today), received critical acclaim and was a major contender for Game of the Year. 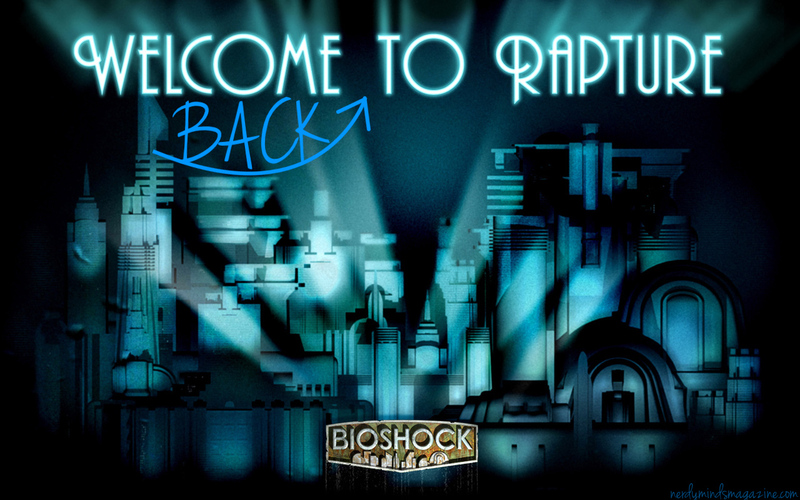 Can Ken Levine’s first visit to Rapture really hold up against such a monumental success as BioShock Infinite? To be honest, I didn’t expect it to. BioShock Infinite was so full of twists, turns, beautiful set pieces, and engaging characters that I figured there was no way that the original could stand the test of time, comparatively. 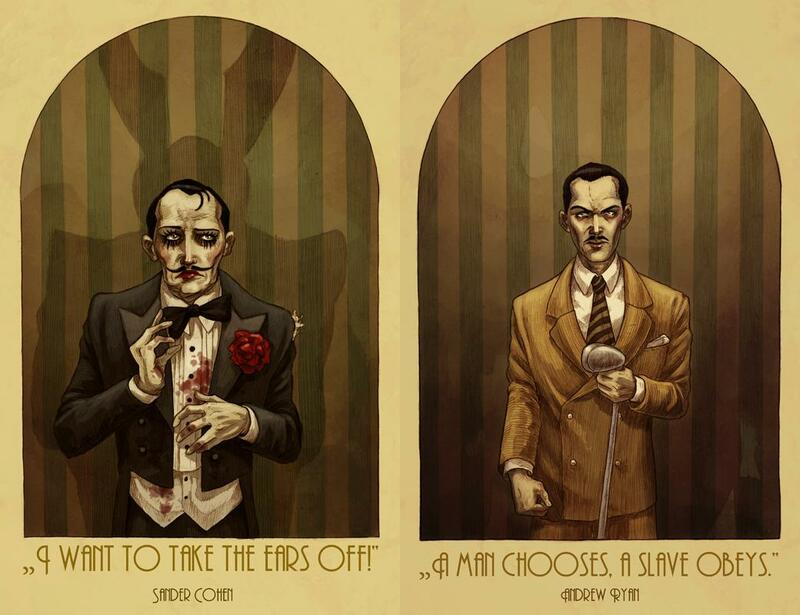 In BioShock, you are only ever in the same room as two sane(ish) people that aren’t trying to kill you – Sander Cohen and Andrew Ryan. Certainly the lack of connection with other people draws away from the experience, right? From the moment the title screen came on I was hooked. I had forgotten how simple the screen was: the BioShock logo at the top, the “Press Start” at the bottom, and that gorgeous serene ocean with a section of lighthouse in the background, all accompanied by haunting piano. Unlike BioShock Infinite, which begins with a calm boat ride and hilarious banter, BioShock gives you about five seconds of calm before throwing you into the middle of the ocean surrounded by burning wreckage, and it only gets more terrifying from there. This was my fourth playthrough of the game, so it’s safe to say that I knew what was coming from the start. That doesn’t mean that it was any less eerie, though. Watching Johnny get gutted by a spider splicer before you even have a radio is terrifying even from inside the bathysphere. Playing on the hardest setting only helped add to the sheer panic that could hit at any moment. The different areas of Rapture are very open, allowing you to hear enemies in any adjacent rooms but not well enough to actually tell where they are. The sound of a splicer ranting would send me frantically toward a corner so that nothing could sneak up on me. Every time I replay this game, I am surprised to find that there are little things that I missed before, some of which are HUGE clues as to what is to come. In an effort to keep the first part of this article spoiler-free, I won’t mention just what those clues were yet (see below the spoiler alert for spoilers). As I began my fourth playthrough, I assumed I’d seen and heard (the voice acting and music is top-notch!) 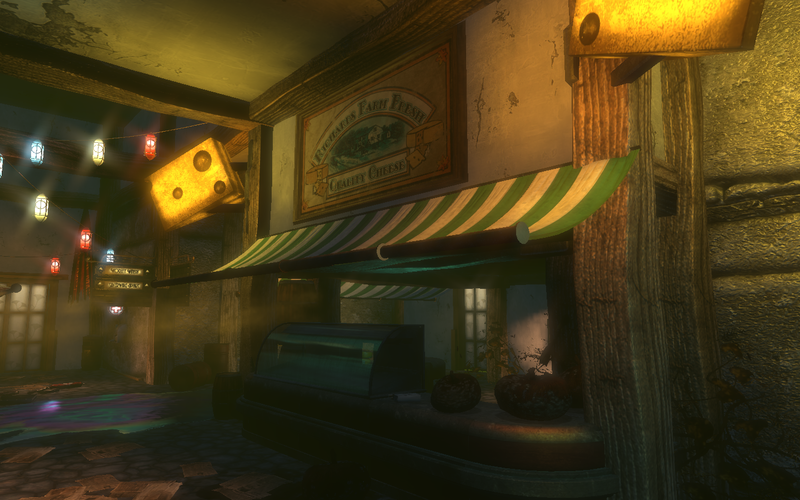 all Rapture had to offer, yet I’ve found myself happening upon small spaces (literally in the case of Arcadia and the Farmer’s Market) with goodies inside that I hadn’t found before. Speaking of the Farmer’s Market, one of my favorite easter eggs was a sign above one of the food stands advertising it as “Richard’s Cheese”. It’s a testament to the writing genius that even a fairly direct reference to a modern day crooner doesn’t feel out of place. Having already earned 100% completion, I have been able to enjoy the scenery and the story rather than trying to find that last audio diary. See below for a short video of my journey back into Rapture. It’s my favorite part of the game: Fort Frolic and working with Sander Cohen. Chances are you’ll find yourself surprised at how great the game still looks and chuckling at the madness that is Sander Cohen. So, does BioShock hold up years later? Have you played the game yet? If not then stop right here. No really. Stop. Why are you still reading? YOU ARE GOING TO HAVE THE GAME SPOILED IF YOU DON’T STOP RIGHT NOW! Okay, good. For the rest of you, here’s the spoilery stuff that made this game fantastic. Even this time I was seeing things that I didn’t remember that could have been huge clues as to Atlas’ true colors if I’d had any inkling that the game had such a good move up its sleeve. I’d seen the “Patrick and Moira” musical poster in Fort Frolic and heard the cryptic babblings of the splicers, but this time around I noticed that it even seemed as though Atlas’ accent fluctuated in and out. And I maintain that even with the reveals in BioShock 2, BioShock Infinite, and Burial at Sea, none holds a candle to the final meeting with Andrew Ryan at his office. Even on my fourth playthrough it gave me chills. Armin Shimerman‘s performance as Andrew Ryan deserves an award. The entire game changes after that one moment; the other games waited until the final moments to reveal their twists. 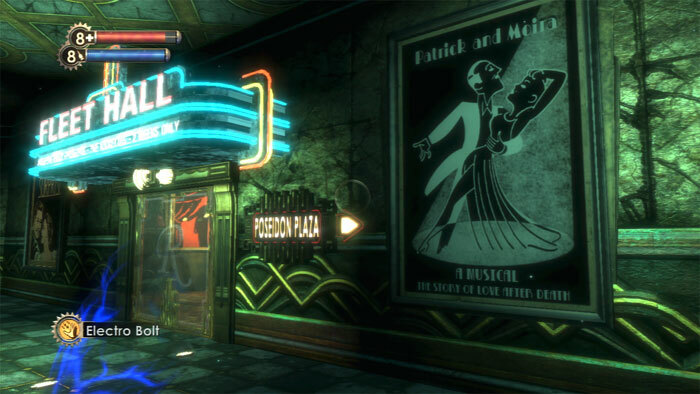 BioShock showed you the twist then gave you another few hours of play time to think, and act, on it.